This peak, situated in the townland of Tangincartoor, is unnamed on OS maps. It is named Knockakishaan on William Bald's map of Co. Mayo (1830). Previously Tangincartoor in MV. The spur to the NW (spot height 311m) is named Knocknabru_ky (with a letter apparently missing between U and K). This may represent Knocknabrusky. Knockakishaun is the 973rd highest place in Ireland. 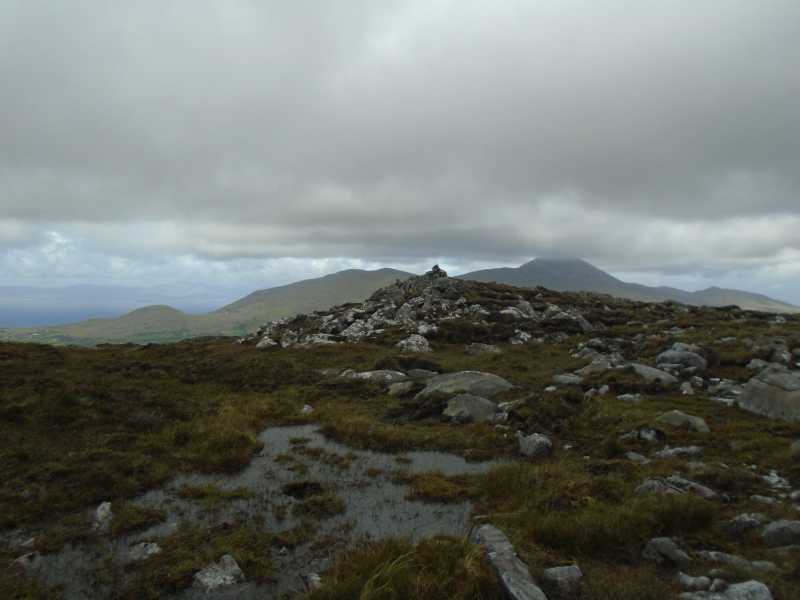 Knockakishaun is the most southerly summit in the Croagh Patrick area. Picture from markwallace : Knockakishaun's small summit cairn, with cloud-capped Croagh Patrick beyond. Picture: Knockakishaun's small summit cairn, with cloud-capped Croagh Patrick beyond. Parked at a layby further up the valley from the crossing point mentioned in James Sheerin's comment to do a circuit of Laghta Eighter and Knockakishaun. Access to Laghta Eighter was easy from higher up the valley, no enclosures, fences, etc. Coming back to the road between Laghta Eighter and Knockakishaun, I spoke to a passing farmer from the valley who said I was welcome to head up Knockakishaun from here, through the enclosed fields, but that crossing the Bunowen river might be easier higher up. I walked upriver a bit, but after the fairly rainy weather recently, the river was up and there seemed to be no comfortable crossing place anywhere. So I drove back down the valley back past L852 751 D where the road crosses the river and parked at a layby opposite a house a bit further down at around L848 755 E. From here a short traverse across bog quickly gives way to a fairly straightforward walk up the boulder-strewn slopes of Knockakishaun to its modest summit cairn.